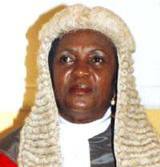 Mrs Justice Georgina Theodora Wood is the Chief Justice of the Republic of Ghana. Irate activists and some senior members of the National Democratic Congress (NDC) have turned their anger on the judiciary over the abysmal performance of the Attorney General and Minister of Justice, Betty Mould–Iddrisu, in the face of recent series of legal defeats that have been trailing her. Following the defeats suffered by the NDC government in court in their bid to jail some New Patriotic Party (NPP) members, the NDC members led by their National Women’s Organizer, Anita de Souza in particular, have made scandalous statements that seek to incite the party’s foot soldiers against the entire judicial administration of the country. Ms. De Souza, as a panelist on Asempa FM’s Ekosii Sen programme, yesterday, openly attacked Chief Justice Georgina Wood and Justice Samuel Marful-Sau of the Court of Appeal, the judge who stopped the NDC government from prosecuting Dr. Charles Wereko-Brobby and Kwadwo Mpiani, President Kufuor’s former chief of staff, for their roles in the Ghana @ 50 celebrations. Anita said they had a list of judges who they knew “are pro-NPP” and called on the President to remove them. She claimed the judges were thwarting the efforts of the NDC government to prosecute NPP appointees who were perceived to be corrupt. Another panelist, whose name was given as Eben, from the Office of the President, said Justice Anin Yeboah of the Supreme Court was pro-NPP and went on to castigate judges for sabotaging President Mills and the NDC government. Already, some pro-NDC newspapers have started accusing Anthony Gyambiby, the Chief State Attorney who handled Dr. Wereko-Brobby and Mr. Mpiani’s case, of being in bed with the NPP. According to the NDC activists, Mr. Gyambiby, who was brought back from the Eastern region, was now doing the biddings of the NPP, citing his comments on the ruling as an affront to the ruling party. Kofi Adams, Deputy General Secretary of the NDC and aide to Jerry Rawlings, had also said he believed some elements within the Attorney-General’s Department had been sabotaging Mrs. Betty Mould-Iddrisu, which had resulted in the loss of several high-profile cases. Mr. Adams, who was not willing to give out names, claimed “the authorities who are supposed to act know” those he is intimating, adding that the unnamed persons were “making sure that they do not succeed”. The NDC Deputy General Secretary said in order for the government to win high-profile cases, its representatives would have to act. “If they do not act, then what is happening will continue to happen”. A member of the NDC legal team, David Annan, confirmed Mr. Adams assertion, adding that the Attorney-General’s Department was already “stocked and filled” with personnel supposedly aligned to their political opponent. Samuel Okudzeto-Ablakwa, a Deputy Minister of Information, according to Joy FM, asked both the NPP and the NDC commenting on the issue to exercise restraint and avoid politicisation of such cases.